The similarities and differences of PlayerUnknown's Battlegrounds and Fortnite Battle Royale. Epic Games’ Fortnite is ablaze on Twitter, Twitch and YouTube channels right now. If you’re not playing it, you’ll certainly have friends insisting that you should, and in even if you don't they're still swooning all over your social media. It’s becoming hard to ignore. If you’re playing PUBG, and getting all that you think you need on the Battle Royale front, we thought you should know why Fortnite Battle Royale is in many ways the same, but in other important ways so very different – these being the reasons why it is doing so well. For a good loot locations guide for Fortnite Battle Royale to get you started, look no further. It won’t cost you a bean to take a look; Fortnite's Battle Royale mode is free to download for PlayStation 4, Xbox One, Mac and PC. Regarding the latter, minimum requirements are set surprisingly low, officially: Intel HD 4000 Core i3 2.4 Ghz 4 GB RAM Windows 7/8/10 64-bit + Mac OSX Sierra. The game runs great on console, which is one of a good number of plus points outlined below. Here’s more reasons why Fortnite deserves respect in its own… rite. 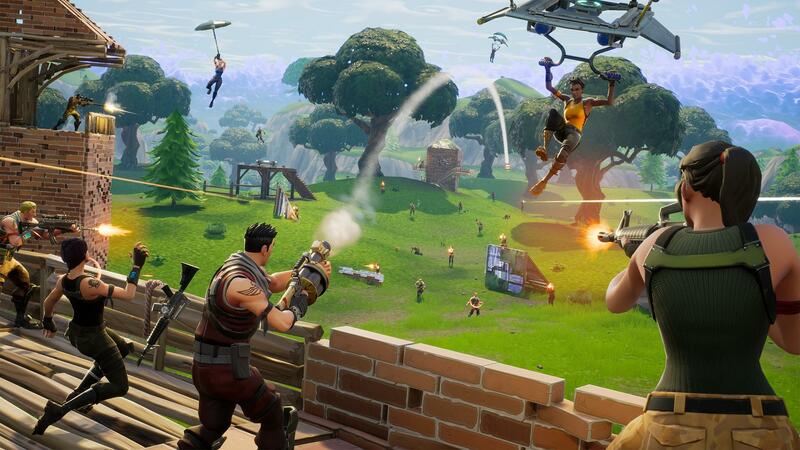 Fortnite started out as a tower defence-style, multiplayer PVE affair, which is still in Early Access at various price-points via Epic Games. The fun really started, however, in September 2017 with the launch of free-to-play Fortnite Battle Royale. When your buddies are talking about Fortnite, they probably mean Fortnite Battle Royale; the mode hogging the limelight. This partly explains why Fortnite has such a stylized art-style, a universe originally created for younger players that wouldn’t be allowed to spend time with grittily realistic shooters. And it’s also apparent that publisher Epic Games always intended this franchise to explode beyond the PC crowd, with versions for PlayStation 4 and Xbox One available from day one. Even if this Battle Royale bubble should burst, Epic Games is attracting thousands of new fans daily thanks to the F2P mode that everyone is talking about. 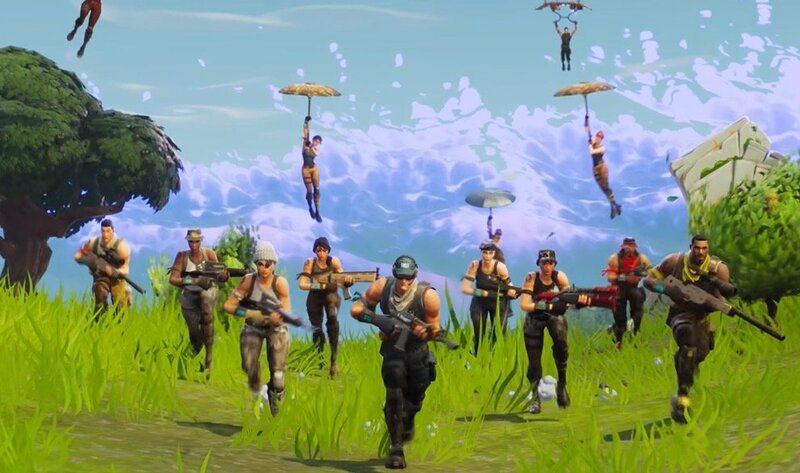 Fortnite is developed by People Can Fly, the studio responsible for the awesome single-player romp that was Bulletstorm (2011) and very respectable Gears of War: Judgement (2013). They know how to create a deep, engaging and very intense shooter, which shines through in Fortnite Battle Royale. Meanwhile, Epic Games’ own Unreal engine is chugging under the hood, a version of which is also powering PUBG. However, Fortnite is much less demanding, allowing for smoother performance on a wider range of PC rigs and platforms. 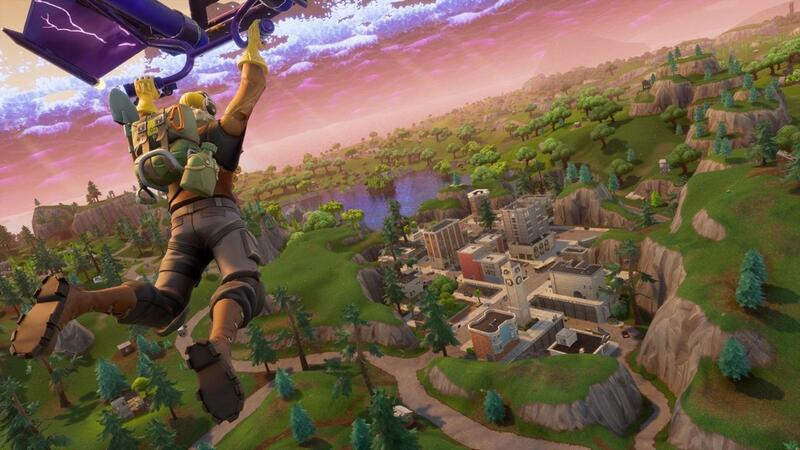 Players free-fall onto a significantly smaller island in Fortnite than PUBG, which immediately puts you in hunting range of rivals. It’s clear that Epic / People Can Fly wanted to get people into the action as quickly as possible, more akin to Call of Duty than Battlefield/ARMA 3. By the same token, firearms are much more readily available, within reach of any landing spot, and found in almost every man-made structure. This means that everybody is armed and dangerous within the first couple of minutes. May not be the best gun in the game, but hey. The Storm Eye, which shrinks the play area, is also very restricting in terms of survivability, especially compared to the wall of death in PUBG. Players are pushed closer together much faster, and cannot use the storm to attempt flanking manoeuvres or score cheap kills from within the storm. We think this is a good thing. Likely owing to its original Campaign game mode, Fortnite Battle Royal heroes do not boast the same range of abilities as in PUBG. Mainly, they cannot go prone and weapon handling is much more basic. It’s designed for lighter-hearted, in your face run-and-gun, and this is where it shines. 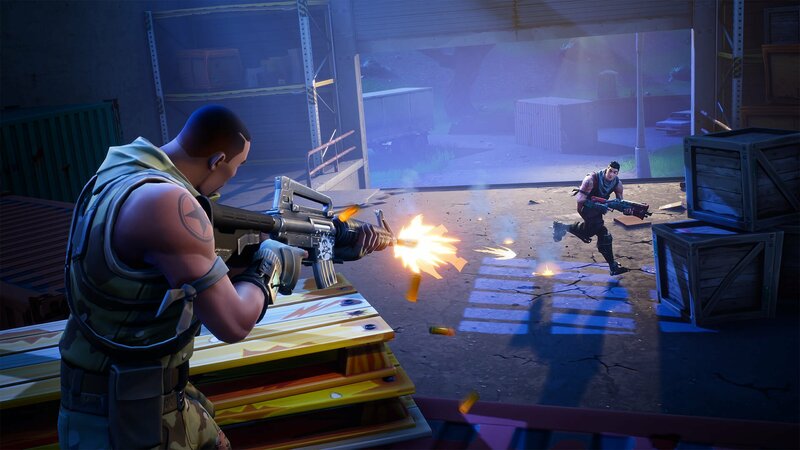 Going toe to toe in Fortnite is much more satisfying and fun than in PUBG, with shotguns, pistols and SMGs performing reliably at close range whereas in PUBG they can feel unwieldy up close. Again, the Call of Duty comparison is relevant here, as opposed to Battlefield with its huge maps requiring vehicles to traverse at speed. Fortnite does not have vehicles, and there are no immediate plans to include them, according to Epic Games. Other than the art style, the stand-out feature separating Fortnite from PUBG is the ability to construct defences, and repurpose strongholds. A good team or cunning individual can build towers to gain high-ground advantage, create barricades, or run alternate access points to buildings. While Fortnite doesn’t boast the same atmospheric effects as PUBG, such as fog and rain, the players themselves can transform landscapes to their advantage. Tactics also relates to weapon variation and customization which, in all fairness, PUBG handles exceptionally well. But in Fortnite’s favor, the smaller pool of weapon types available levels the playing field, and plays into the more family-friendly, frustration free environment that Epic Games is aiming to cultivate. 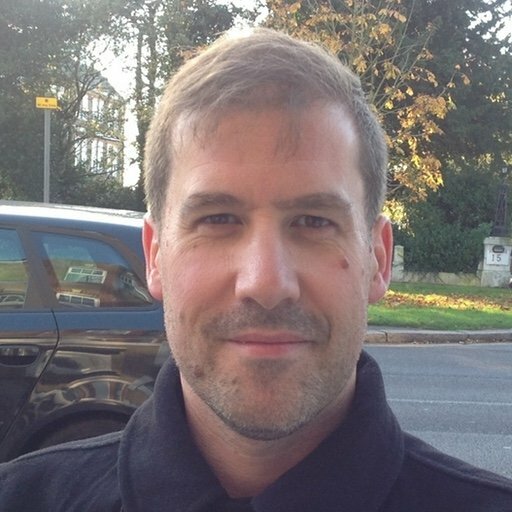 Creative Director Darren Sugg has been posting monthly updates on YouTube since launch, and in general Epic Games’ communication with fans has been outstanding, and honest. In game, the voice-chat seems relaxed compared to PUBG, with fewer toxic personalities to spoil your fun. This points to the laid-back feel, and fans not taking the experience quite as seriously as PUBG. Arguably this also highlights why PUBG maintains its popularity, owing to gameplay depth that players strive to perfect. Fortnite is more rough and ready we guess. We’re not trying to twist your arm, stupidly arguing how Fortnite is the only game in town. However, we do hope that the points mentioned help you to recognize the potential, and suggest a saccharine palette cleanser at the very least between intense PUBG sessions.